The opportunities available for working within government were just some of many insights Year 12 student Macacia gained whilst attending Work Exposure in Government (WEX) 2018 in Canberra earlier this month. She was one of 70 students chosen from all over Australia to attend this experience of a lifetime. WEX is an opportunity for high-performing Aboriginal and Torres Strait Islander students in Years 11 and 12 to learn about careers in the Australian Government. The five-day interactive program was held from Sunday, September 9 to Friday, September 14, 2018. For Port Augusta Secondary School student Macacia, the experience is one she will never forget. “The experience was really good, I didn’t want to leave!” she said. She said the best part was making new friends from all over Australia. “I met people from all over Australia and I learned about everyone’s different cultures,” Macacia said. The aspect Macacia enjoyed most was the visit to Parliament House. She said it opened up her eyes to how she could potentially make a difference. “It opened up my mind for other possibilities for work. I realised there are so many opportunities out there for me, and not just in my home town,” she said. A surprise element of Macacia’s visit to Parliament House was Federal Member for Grey, Mr Rowan Ramsey, coming to meet her and taking her on a tour of some of the private areas of parliament, including the party room and his office. She said it was totally unexpected. “He read my application (to attend WEX) and came to find me,” Macacia said. “When we went to his office he sat me down and he asked me what he could do to make things better (for the region). “He asked me where I worked now and I told him in child care and a bank. Macacia said she applied to attend WEX because she thought it would be a good experience and a good pathway into future careers. She said she was surprised but proud to be chosen to attend. “I had to write an essay on why I believe I should be chosen to go,” she said. Macacia said she would encourage other students to apply for future WEX programs. “It’s such a good opportunity, you learn so much and not just about working and governments, but also about yourself and your culture,” she said. Through WEX, participants learn about jobs and career opportunities in the Australian Government; applying for government jobs; how laws are made and enforced; and support available to Aboriginal and Torres Strait Islander employees. All accommodation, transport costs and meals are provided. Activities included meeting senior government Ministers and parliamentarians; visits to the Australian Defence Force Academy and the Australian Federal Police headquarters; visits to national institutions such as the Australian War Memorial and the Museum of Australian Democracy; a tour of Parliament House; and a careers expo, where students learned about jobs in a range of government agencies. 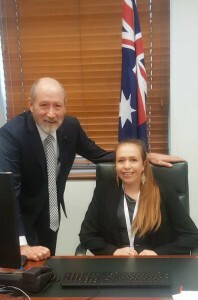 YES student Macacia Marich with Federal Member for Grey, Mr Rowan Ramsey, in his Parliament House office, Canberra.